A new geology theory featuring impact-powered rapid continental drift as an alternative to plate tectonics. The key to creation geology. In "Beyond Plate Tectonics: 'Plate Dynamics'" author Richard Moody, Jr. tweaks the systematics of orthodox plate tectonics while maintaining its basic concept of continent-sized slabs of earth crust shifting position, colliding with adjacent huge slabs and diving into the mantle under them, a process without a power source other than heat from the planetary interior. Plate tectonics originated from the geographical observation that the coastal profiles of South America and Africa seem to fit one another, al though the continents had been pulled apart. First proposed by Alfred Wegener in the 1920s, the crust was imagined to be made up of continent-sized slabs that "float" on a liquid layer and thus "drift" around. The idea was also rejected as a fantasy. The matching coastlines could also be imagined as developing from a pulling apart by earth expansion. No precedent existed for this idea either, which seemed too fantastic to countenance. Continental drift, now known as Plate tectonics, was revived in the 1960s when the mid-Atlantic ridge and associated transform faults were discovered, along with compelling evidence for injection rock caused "spreading" of the walls eastward and westward, thus leaving parallel north-south trending stripes of injected rock, the youngest of which was adjacent to the injection rift and the oldest farthest from it. Another dilemma then arose: how to accommodate additional seafloor width without invoking Earth Expanding, which was shunned as fanciful by Plate Tectonics faithful then, as now. The Plate Tectonics solution to the seafloor spreading dilemma was the proposition that new crustal mass created by injection must be compensated by "subduction", the diving of ocean crust under opposing continental plates after plate collisions. Seismology obliged by attributing some layered reflections near continental margins to "plates" that were conceived to be subducting. Why the Earth Expanding explanation is shunned goes back to antiquity. Philosophers believed that physical matter must be made up of "elements", permanent tiny components from which everything else is made. In antiquity, the elements were thought to be fire, water, air, and earth. By the nineteenth century chemical elements were recognized, and 92 of them had been identified. These were regarded as the smallest components of matter, irreducible and indestructible. But that attribution was soon degraded when radioactivity among the heaviest elements proved their instability and thus, their non-elemental behavior. Notwithstanding the inherent failing of the idea or elements, most twenty-first century scientists including PT enthusiasts, adhere to the idea that elements are the building blocks of the entire planet. On this premise the elemental count, and the volume of the earth necessarily remain constant. Earth expansion is impossible if the elementarian principle is true. The observable geology of crustal addition on the mid-ocean ridge thus requires PT, whereby crustal components of the earth are shuffled around and some of it is "subducted" in order to compensate for the mid-ocean additions and to avoid EE. As H.L. Mencken said, for every complicated problem there is a solution that is elegant, simple - and wrong! That is the situation with PT, in my view. Firstly, there is little concrete evidence for subduction, especially where it is needed most, adjacent to the stripes of added crust beside the mid-ocean rift. Secondly, there is no evidence for a world wide fluid base below the continents and instead, much evidence that continental roots are deep, giving them a shape like a tooth rooted deep in the mantle, rather than a thin plate shape detached from the mantle and floating above it. Thirdly, subduction is not a mechanically sound idea because there is no conceivable source of energy that would force less-dense shallow crustal rock to sink into denser mantle rock. Leaving, for the moment, the deficiencies of PT theory, one must ask if there is any alternative whereby new material may be added to the crust. The answer comes firm and positive from the later in the twentieth century researches of the Russian geologist Vladimir N. Larin (Hydridic Earth, 1993, Polar Publishing). Larin's repeatable laboratory experiments demonstrate that metals at mantle pressures in a hydrogen atmosphere absorb hydrogen nuclei, which transmutes them to high-density "intermetals". Intermetals are fluid forms without specific atomic mass. Abundant hydrogen must permeate the mantle and core of the planet, just as it does the rest of the universe. All metals, and especially the transition metals silicon and carbon, occurring in the planetary interior likely exist as high-density, low-volume hydride forms. Being fluid, they have an ability to coalesce and rise as plumes into crustal levels, where reduced pressure and oxides (water) cause reversion to true metals or oxidation to deposit rock-forming minerals. The rock deposits of the crust are lesser in volume than their intermetal progenitors and therefore prove the existence of EE by their very existence. The very concept of "elements" is fallacy, because abundant ydrogen destroys metal characteristics. Whereas the inherent volatility of hydrogen had made its presence within the earth incomprehensible, and whereas it was natural that science would attribute earth composition below the crust to "elements", Larin's experiments demonstrate that the behavior described above and shine new light on the nature of the interior of the earth. 1) Geothermal heat may be partially primordial; as generally thought. But the heat emanating from the crust is likely largely heat generated by oxidation of intermetal hydrides at the base of the crust and within it. 2) Petroleum and natural gas result from the effusion of the hydride of carbon, methane (CH4), which bacteria and archaea attack in the upper crust, "degrading" it to petroleum and coal. 3) Metal ore deposits within the crust can be attributed mainly to de-pressurization and/or oxidation of intermetals. Although this diagram shows the interaction between continental and oceanic plates, the processes illustrated generally apply for the interaction between two oceanic plates. 1. There are two basic types of LITHOSPHERE: continental and oceanic. CONTINENTAL lithosphere has a low density because it is made of relatively light-weight minerals. OCEANIC lithosphere is denser than continental lithosphere because it is composed of heavier minerals. A plate may be made up entirely of oceanic or continental lithosphere, but most are partly oceanic and partly continental. 13.The newly generated molten mantle (magma) is less dense than the surrounding rock, so it rises toward the surface. Most of the magma cools and solidifies as large bodies of plutonic (intrusive) rocks far below the Earth’s surface. These large bodies, when later exposed by erosion, commonly form cores of many great mountain ranges that are created along the subduction zones where the plates converge. Plate tectonics processes almost certainly have been operating since the formation of the Earth (~ 4.6 billions years ago). However, the evidence of such processes very early in Earth’s history have been masked or obliterated by younger geologic processes and deposits. Present-day continents are much older geologically than the seafloor of present-day ocean basins. Earliest recognized and dated continental rock (in Australia) was formed about 4.3 billion years ago. In contrast, the geologically oldest seafloor formed about 180 million years ago. Why this huge difference in geologic age between continental and oceanic rocks? Answer: the new crust formed along the ocean ridge crests is carried away by plate movement, and is ultimately “recycled” deep into the earth along subduction zones. But because continental crust is thicker and less dense than thinner, younger oceanic, most does not sink deep enough to be recycled and remains largely preserved on land. Present-day continents are fragments of a “supercontinent” (Pangaea) that broke up about 225 million years. There were a number of pre-Pangaea supercontinents, although the evidence becomes more and more obscure/problematic the farther back in geologic time. Pangaea itself was the product of accretion of fragments of pre-Pangaea supercontinent. More than 80% of the world’s earthquakes and volcanoes occur along or near boundaries of the tectonic plates. Discovery and mapping of the rugged topography (e.g., huge mountain ranges, deep canyons) and the “magnetic striping” of the ocean floor were important milestones in the development of the plate tectonics theory. Earth is the only planetary body in our solar system that exhibits plate tectonics in action—at present as well as in the geologic past. To date, space-based planetary geological studies have not discovered any evidence of extra-terrestrial plate tectonics. 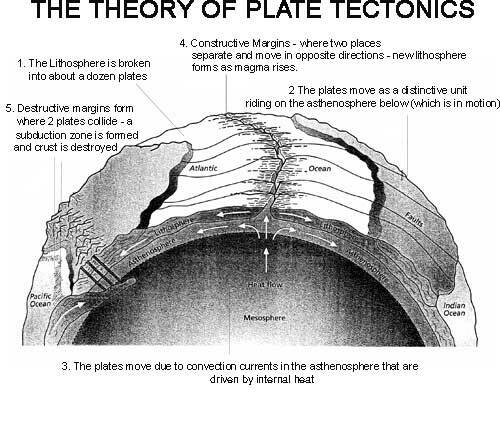 Beyond Plate Tectonics: 'Plate Dynamics by Richard Moody, Jr. '"
At least we can move away from plate tectonics and realize the Earth has indeed expanded. One would think primordial hydrogen would long be gone. So what is producing it? Deuterium splitting? What is producing deuterium? The questions are endless. Hey, Malysha. We send you info on your e-mail. Thanks!